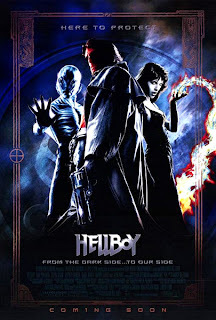 In lieu of the "Captain America: The Winter Soldier" (it hasn't released here yet), I decided to catch up with another popular comic book movie this week - "Hellboy". Released in 2004, this fantasy/action film showcases many of the directorial skills that we've come to associate with Guillermo del Toro. Two years before his magnum opus ("Pan's Labyrinth"), he served up this thrilling, visually impressive interpretation of a superhero. The film begins in 1944, with the Nazis conducting a secret experiment to strengthen their defense. They've developed a portal that will summon monsters to aid them in the war. The initiative is lead by a Russian mystic named Grigori Rasputin, who believes that this will make the world a better place. Unfortunately, the plan is thwarted by a team sent by the Allied Forces, leaving Rasputin consumed by the destroyed portal. In the wake of the destruction, a harmless baby demon is left behind. He is adopted by the Allies and given the name Hellboy. Fast forward 60 years and Hellboy (Ron Pearlman) is now a fully grown adult, hidden away in the Bureau of Paranormal Research and Defense. He lives a peaceful existence under the watchful eye of his adopted father Trevor Bruttenholm (John Hurt) and other guardians. Danger awaits however, as Rasputin is resurrected and intends to finish what he started. With his band of fearsome creatures, he unleashes havoc. As the titular hero, Hellboy's task is a bit complicated. Much like Superman, he is tasked to defend planet earth against enemies that are more akin to his own kind. Of course, as a hulking red demon, he's treated as an outsider among the humans, with every public sighting resulting in a storm of news headlines. In many ways, he's much like the "freaks" we call the X-Men. As a result, he has to derive mainly internal motivation to play the savior. Tie this all together with some of the dark, brooding atmosphere made popular by The Dark Knight trilogy and you get a compilation of practically all the signature comic book elements. My reason for making these comparisons is twofold. Primarily, it's reflective of del Toro's vision for this film. Being a fanboy himself, he fully embraces the comic book origins of this story. Even as the atmosphere is dark and moody in a Nolanesque way, the main character is much more light-hearted. The tortured soul is now the new normal, but on this occasion del Toro gave us a throwback comic book style, emphasizing the playfulness. 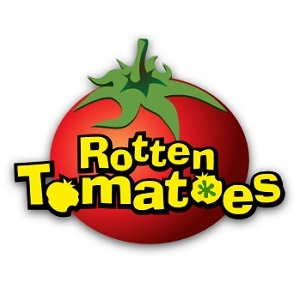 With striking visuals, grotesque creature design and a snarky, amusing performance by Ron Pearlman, del Toro thus blends the macabre and the zany like only he can. On the other hand though, it would be dishonest to ignore the shortcomings of the script. For a film with such imaginative visuals, its typical plot is rather disappointing. It's bound to feel very familiar. Essentially, it's the misunderstood hero fighting against the forces of evil, with some romance thrown in for good measure. In spite of its flaws however, del Toro compensates with genuinely thrilling action scenes and eye-popping visuals. So even when you start to feel wary of the writing, you're still invested in the "Bang! Pow! Boom!". It's a formula that has worked for him numerous times (I'm looking at you "Pacific Rim"), so props to him. As they say, if it ain't broke, don't fix it. I'll certainly be coming back for more. Good review Shane. A childhood favorite of mine, that somehow crossed into my somewhat-adulthood and still held-up. Barely ever happens for me. Thanks Dan. It's definitely a fun film, looking forward to watching the sequel. I've really enjoyed the Hellboy films. Ron Perlman is great and del Toro does a great job at capturing the mood/world of the character. It's not a perfect movie and loses its way towards the final third but better than many of the "superhero" films. Yep, you're right. Really need to check out the 2nd film.